Database, analytics and business intelligence specialist. I find actionable insights in complex data. In 2010, I left IBM to join Blueprint. I have 10 years experience in data, reporting and business intelligence solutions. Working with our clients at Blueprint provides me with an unmatched opportunity to deliver business critical insights and reporting solutions. In addition to my role as technical director, I also look after our company finances. 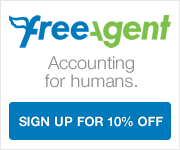 We have been using FreeAgent for some time now and I must say, it has revolutionised our accounting practices. Click the link below for more information. If you decide to sign up, you can use our sign up code for 10% off. Can't believe @TSB still make you fill in a paper form to change your postal address!